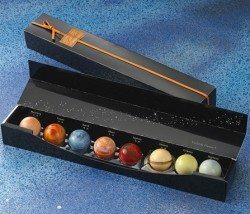 Planetary Chocolates – Who doesn’t love space and chocolate? Okay, well, maybe not so much the former subject, but most people love chocolate, especially chocolate that tastes great and is packaged in a sweet gift box. Your clients will definitely feel your appreciation as they munch on Venus and Jupiter. 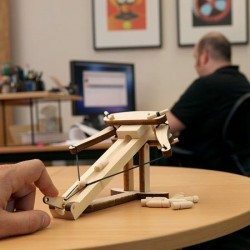 Mini Wooden Ballista – While this might be a bit of a risky buy for some of your clients, chances are that at least one of them will get a huge kick out of loading and firing their own office desk assault weapon. Maybe it’s just me, but I love the idea of firing little wooden projectiles at my co-workers! At the very least firing a mini ballista is a great way of blowing off steam. Self Stirring Mug – Chances are your clients drink coffee or tea, or at least hot chocolate. What is the most tedious part of drinking hot beverages? Stirring in the cream, sugar, cocoa powder, or whatever else is needed to complete the drink. Let your clients know you know they work hard and deserve a break from the annoying little things with a self-stirring mug! 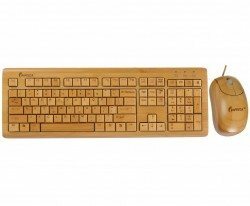 Real Bamboo Keyboard and Mouse – Every business has a computer these days and your clients have probably logged plenty of hours staring at a computer screen while typing away. Bring a little bit of nature’s goodness to their office with this beautiful, 100% bamboo keyboard and mouse combo. Lumiware Color Changing Coasters – These LED drink coasters are a classy, cool upgrade for any home or office that uses them. If you love your clients, you’ll make sure they feel like every time they put their drink down it’s Friday night at the club, and you can do that with these coasters!  Custom Mini Lego Figure – Lego is a toy brand that has been loved by girls and boys, men and women, through the years. There are two incontrovertible truths in this world: “everyone dies” and “you’re never too old to play with legos” (forget that first truth, it’s too much of a downer for a Christmas gift post). 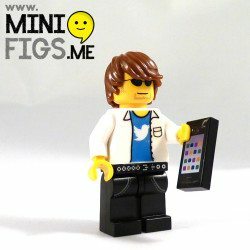 Imagine the ecstasy of your clients when they open their appreciation gifts to find little Lego mini-me’s of themselves! 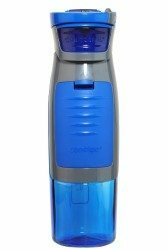 Contigo Water Bottle with compartment – For clients who enjoy the outdoors, fitness, or just water, the Contigo water bottle is an excellent option. The leak-proof bottle has an easy button-push opening for click swigs of water without fear of dribbling down one’s chin. And this particular Contigo model comes with a handy compartment where you can keep keys, money, and cards close at hand and safely stored. Perfect for people who are ready to hit the gym with their New Year’s resolutions! Personalized M&M’s – Did you know M&Ms are scientifically designed to be addictive? They were also scientifically designed to bring happiness to clients! 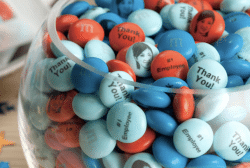 Okay, I made that last fact up, but my working hypothesis is that if a client opened a bag of personalized M&Ms that had their name, their business name, and “thank you!” printed on each candy in tiny letters, they would feel pretty darn happy. Feel free test my hypothesis and send personalized M&Ms to your clients. Then write a research paper on your findings. Or not. 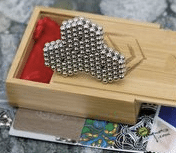 Zen Magnetic Balls – The squishy stress ball is old news. The cool kids clients are now using Zen Magnets to relieve stress and express their creativity. With shape possibilities only limited to one’s imagination, the client lucky enough to receive this gift will spend hours constructing and displaying their creations for their co-workers to see and admire. 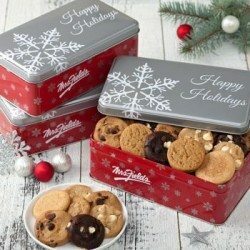 Christmas Cookies – Client gifts can be just for an individual, or they can be for an entire office, like this beautiful tin of delicious Christmas cookies from Mrs. Fields.  All you have to do is place your order on the site and they’ll be delivered straight to your favorite business’ door. Of course, you can also get the tin for individuals as well, if you think they can handle a tasty cookie-eating marathon.